The standard series pipe clamp is offered in an assembly. Each assembly includes 2 Hex bolts, cover plate, cushion set and weld plate. Hardware is offered in carbon and stainless steel. Click photo to view spec page. The standard stacking assembly is offered in an assembly. Each assembly includes a stacking plate, 2 stacking bolts, 2 washers and a cushion set. Hardware is offered in carbon steel or stainless steel. Click photo to view spec page. The standard rail nut assembly is offered in an assembly. Each assembly includes 2 rail nuts with o'rings, a cover plate, 2 hex bolts and a cushion set. C-Rail sold separately. Hardware is offered in carbon steel or stainless steel. Click photo to view spec page. The standard twin series pipe clamp is offered in an assembly. Each assembly includes 2 Hex bolts, cover plate, cushion set and weld plate. Hardware is offered in carbon and stainless steel. Click photo to view spec page. The heavy duty twin series pipe clamp is offered in an assembly. Each assembly includes 2 Hex bolts, cover plate, cushion set and weld plate. Hardware is offered in carbon and stainless steel. Click photo to view spec page. The heavy duty series pipe clamp is offered in an assembly. Each assembly includes 2 Hex bolts, cover plate, cushion set and weld plate. Hardware is offered in carbon and stainless steel. Click photo to view spec page. The heavy duty stacking assembly if offered in an assembly. Each assembly includes a stacking plate, 2 stacking bolts, 2 washers and a cushion set. Hardware is offered in carbon steel or stainless steel. Click photo to view spec page. 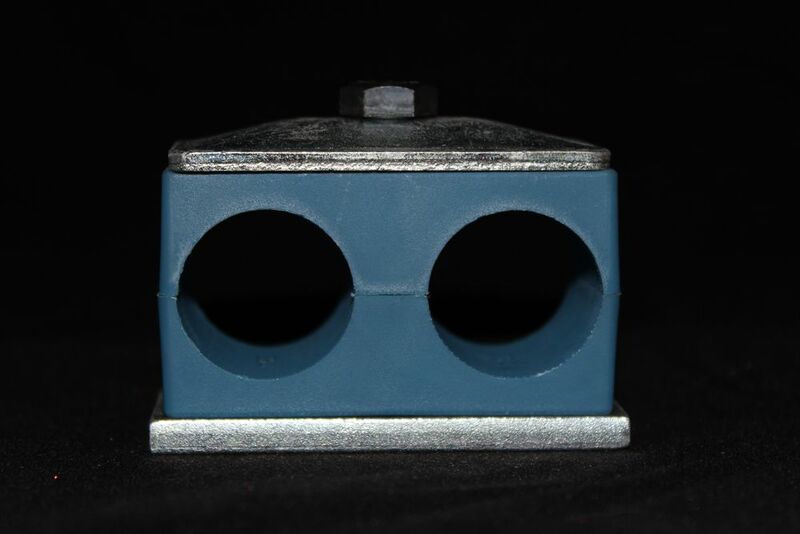 The heavy duty rail nut assembly is offered in an assembly. Each assembly includes 2 rail nuts with o'rings, a cover plate, 2 hex bolts and a cushion set. C-Rail sold separately. Hardware is offered in carbon steel or stainless steel. Click photo to view spec page. 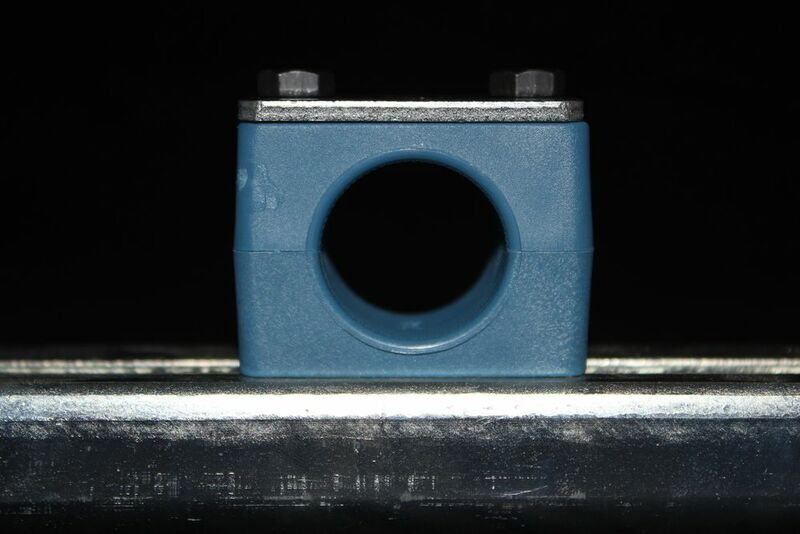 The standard series w/ rubber bushing pipe clamp is offered in an assembly. Each assembly includes 2 Hex bolts, cover plate, cushion set, rubber bushing insert and weld plate. Hardware is offered in carbon and stainless steel. Click photo to view spec page. The heavy duty series w/ rubber bushing pipe clamp is offered in an assembly. Each assembly includes 2 Hex bolts, cover plate, cushion set, rubber bushing insert and weld plate. Hardware is offered in carbon and stainless steel. Click photo to view spec page.